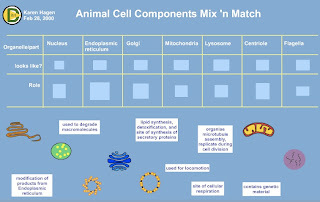 "Animal cell mix and match" and "Plant cell mix and match" are two flash animations written by Karen Hagen and presented by the University of Alberta on their cell biology instructional multimedia website. These two multimedia games will help you review the structures and roles of organelles in cells. Not all of the major organelles have been included. The activity is presented like a chart with each organelle on top. The first row is called "looks like" and the second row is called "Role". 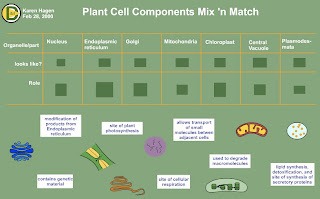 At the bottom of the chart, there are pictures of each organelle and description of the roles. Students are then invited to drag-and-drop each picture and each role at the proper location in the chart. The feedback to correct the answers is not always clear. When a picture or a role is in the proper location, it fades a little bit and can't be moved anymore. It is not always clear for the student. A better signal such as a sound would have been more appropriate.